After parting with Dave, we headed south, leaving the castles route. Away from the river valley, it became more rolling, but still very pleasant. Ended up at a club site, tho not sure what club: ever so friendly, but alas after a long day, we’re good only for bed. On leaving, we remarked on the rarity of a start downhill. Little did we know, after very few km, we hit a monster: 2km of 16%. Ouch! After that, rolling country, mostly little farm tracks, but well surfaced. The next site is commercial, but home it seems to a small permanent community, living in caravans that have grown roots; we often see those on German sites. One gent kindly offers us a big pot of boiled spuds n carrots, overcatered it seems. A welcome change from our endless pasta. Shortly after leaving, the way is hastily blocked by a farmer, whose cows then come round the corner. Then off the road they trot, into a lush green buttercuppy meadow, to happy moos and a bit of gambling. He explains it’s their first time out this year. Last week there was deep snow here, the cows were still indoors. Then he invites us in for a coffee, but alas, we really need to get on. This becoming typical, so many people are so kind. After some time over this rolling idyll, we are closing on Ulm. This is a long-planned stop, to meet up with some of Gideon’s friends from Continental. Both Melchior and Joe had offered us a bed. Joe’s location was a lot better, so to Blaustein we went. Amazingly the last 5km were flat. But Joe put in a last little really steep Street, to make us appreciate the rest. Wonderful warm reception from Joe and Anke & daughter Anja. Melchior turned up for tea and to plot the next few days. Weds was a welcome rest day, visiting Ulm, climbing the steps up the Munster, and replacing some broken kit. Oh, and our first real blog update… That took hours! Also got useful input on Gideon’s creaking front hub, from Joe’s favoured bike shop. But nothing can be done quickly enough, as Thursday is a bank holiday. So it’ll have to soldier on. Many, many thanks to Joe & family for the hospitality. Besides the physical benefits, it was so nice being wrapped up in real home, and having extended conversations and joining in. Thurs morning, we set off with Joe and Anke (nice new bike! ), and RV with Melchior and Sonia at the station. 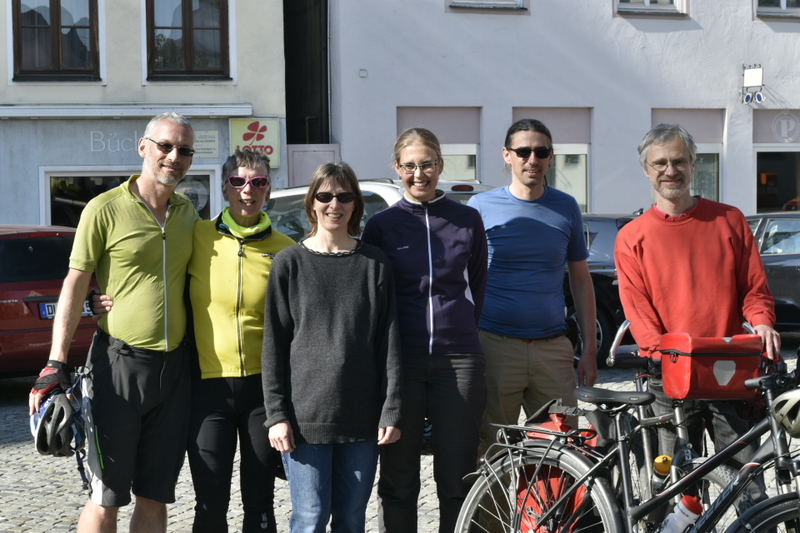 Off we all go down the Donau (Danube in English) radweg.